For the last few years I have been collecting citations of all papers related to DNA Barcoding. Main reason was initially to make my life easier when it came to manuscript writing. Modern citation management software is really a big help and when I started my work on this blog it became even more helpful. The last I want to claim is that I have them all but I think I have most of them and I thought I start sharing some numbers that I was able to extract from my dataset as they show an impressive picture of a still rather young field in biology. The most impressive number first: Since the publication of the famous Hebert et al. paper in 2003, 2014 publications somehow involving DNA barcoding have been produced. 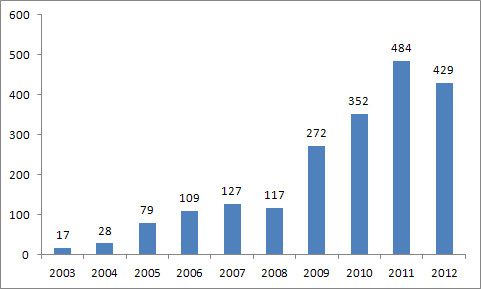 The first figure shows the steady increase over the last nine years. The small decline in 2012 is likely due to the fact that the year isn't over yet. Within two years the barcoding movement had started global campaigns to start building libraries of groups that were considered feasible or of relevance for society. 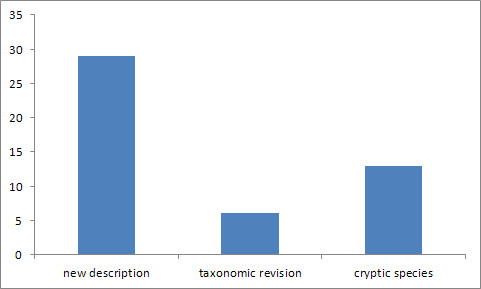 Those were either chosen based on taxonomy (e.g. Lepidoptera, Fish, Birds) or habitat (e.g. marine or polar). 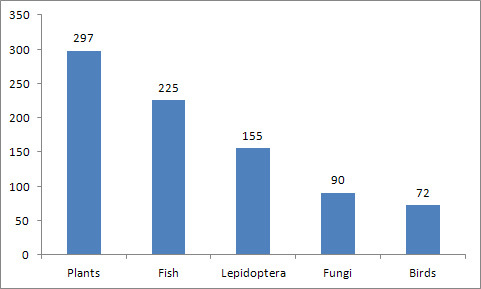 Here are some numbers of publications with taxonomic focus which are perhaps more a measure of impact in the particular community. The high number of plant related publications is surprising as the majority of papers (87%) has been published after 2008. Around the same time the community of marine researchers formed a global campaign and as its former leader I am proud to report that 410 barcoding publications on marine life have seen the light of the day. Studies focusing on the Arctic and Antarctic regions amassed 107 papers over the years. I'd like to show one more example in today's post and a few more in future ones. Over the years DNA Barcoding has also been heavily criticized (actually only in 28 papers). One of the criticism was that it would not help to improve current taxonomic knowledge. I picked the lepidopera dataset and had a closer look. The result is that 31% of all papers on butterflies and moths are either discoveries of cryptic species, new descriptions or taxonomic revisions. If that doesn't qualify for some impact of DNA Barcoding on taxonomy I don't know what does. I know of course that simple counting of numbers of publications in a particular field of science is not 100% accurate but I believe it is enough to show some trends and for sure it demonstrates how rapidly the discipline grew within the last 9 years. Who would have predicted that? Who ate all the twigs?